We are honoured to be part of the growth and development of Rwanda. Everyday, we continue to see opportunities to capitalize on our commitment to a stronger and bolder Rwanda. A Rwanda build on strong foundations. We are committed to going beyond the production of cement by working tirelessly to deliver on our brand promise of “STRENGTHENING RWANDA”. It is the strength of our guarantee. 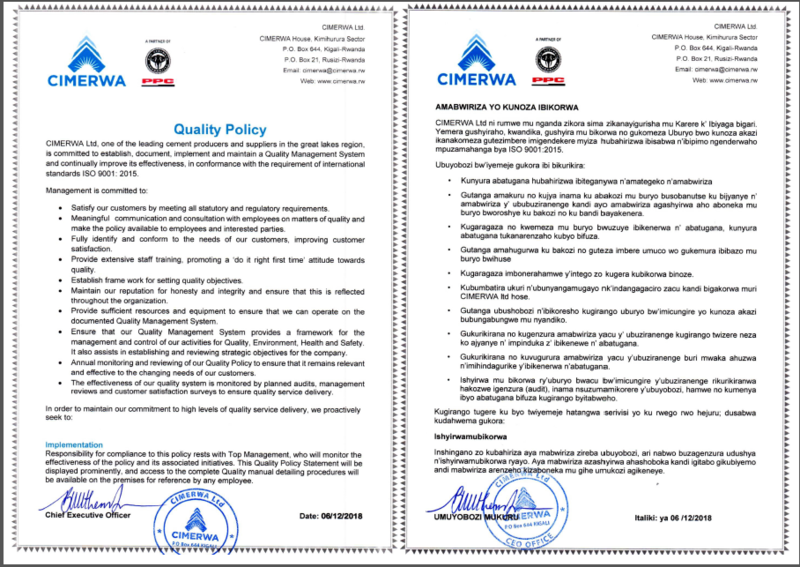 The integrity placed behind every purchase, every interaction; the knowledge that when you buy CIMERWA Cement, you too place your trust in our name & word. It is the strength to care for our environment, ensuring we minimize the impact we have on the future sustainability of our planet by adhering to environmental best practices in our facilities and through our products. It is the strength of our ability to foster growth and purposeful partnerships. Partnerships that will push us to incessantly seek to be a force for good with the world around us, continually impacting the lives of the people we serve in a tangible and meaningful way.